AnonD-214508, 12 Dec 2013The Moto G also has white notification light (just to the right of the front camera) however, ... moreNo, it works out of the box. My girlfriend's Moto G did. 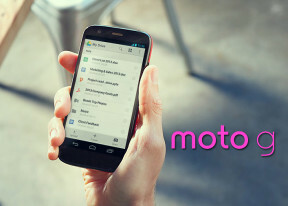 The Moto G also has white notification light (just to the right of the front camera) however, it only works if your download the motoroal mobility notification light widget from the play store. AnonD-187321, 12 Dec 2013Sony Xperia M is better than G except G's display g has awesome display but overall M is BetterXperia M has poor display, battery, processor compared to Moto G. Also very less internal memory. Only 4GB. RAM, GPU, Camera are same on both handsets. Build quailty is good on both the handsets. Moto G has 4.3 with no custom UI & will get kitkat(4.4) in january. Only advantage Xperia M has over Moto G is NFC, which is not so useful & very few people use it. Last but not least, Moto G supports USB OTG out of the box. AnonD-187321, 12 Dec 2013Sony Xperia M is better than G except G's display g has awesome display but overall M is Betterare you serious?? Or just saying??? AnonD-109004, 12 Dec 2013What about gaming buddy? How does the gpu performs?? And what model have you purchased? 8/16? ... moreChecked on youtube and gaming is fine - struggles a little on ultrahigh graphics - but so do many midrangers! Nothing to worry about here! AnonD-187321, 12 Dec 2013Sony Xperia M is better than G except G's display g has awesome display but overall M is BetterXperia M is far too big for considering its smaller display! Xperia M is actually as tall as the xperia T - I compared them! Also less internal storage in xperia M - talk sense as everyone knows that moto g is far better than the M! I thnk it dosnt hav a good quality of camera at low surface as nokia nd its internal cpcty is low nd non upgradable. I should have added that you press down on the screen for a second to bring up the settings menu. I have found the Galaxy S4 (Google Edition) camera app that works fine on the Moto G, and it greatly improves the quality. MM, 12 Dec 2013the camera is sad. *sigh*'Sad?' I wouldn't even rate it that high! i m sold out for excellent audio quality and excellent call quality... thickness of d phone helps put in a excellent speaker. Would not mind paying just a little extra for better camera quality. Erick, 12 Dec 2013As an owner of this device I can confirm that this offering from Motorola represents outstandi... moreWhat about gaming buddy? How does the gpu performs?? And what model have you purchased? 8/16? And how much user memory is available?